(Washington, D.C.) In the wake of Great Britain’s recent populist-led decision to leave the European Union, momentum gathered quickly for the United States to follow suit. 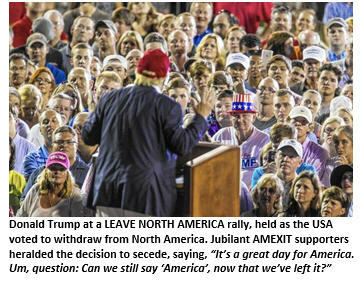 In a flurry of referendum-lobbying activity, spurred on primarily by Donald Trump and his vocal supporters, citizens went to the polls yesterday, and in one of the closest margins in history – 50.1% to 49.9% – voted officially to exit the continent of North America. The domestic and global implications of the separation are as yet unclear. For example, experts are debating whether this vote might create the long-sought opportunity to finally kick out Texas. It is anticipated that the North American withdrawal process will create scores of logistical headaches as government agencies scramble to figure out exactly what this decision means. Senior administration officials express concern that there are no provisions in federal statutes, case law or the Constitution itself to provide guidance as to how to leave a continent. In more hopeful news, Donald Trump has indicated that he knows exactly how to do it and has an amazing plan, promising that the resulting new nation will be a YUGE improvement. But so far details of his plan have not been released.